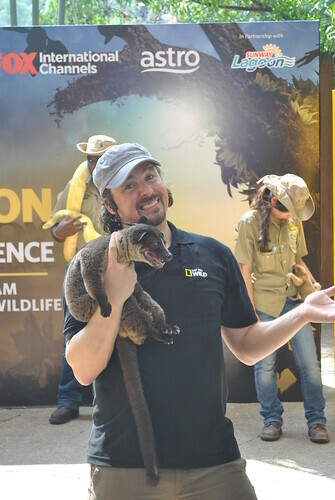 Couple of days ago, I had the privilege to be part of the media team to attend a press conference with Casey Anderson of America The Wild. Season 4 of America The Wild will be premiering on Malaysian TV Nat Geo Wild (Astro Channel 550) this March 16, 8.40pm. My husband loves these wild animal shows (as do all men), me not so much, but after this meeting, I will definitely be catching all the episodes and I’ll tell you why below. 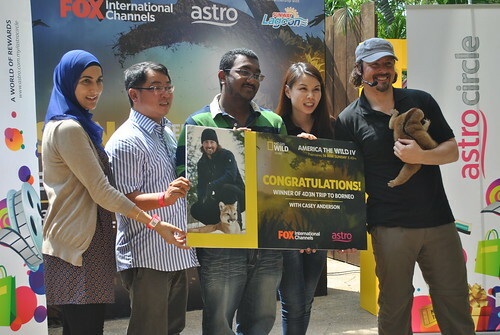 Part of the reason for my excitement to join this press conference was that it was held at Sunway Lagoon Wildlife Park. I really wanted to check the place out so maybe I can bring my boys there in future. Follow me to read my review of the Wildlife Park next. So as I was entering the Theatre where the conference was held, the MC of the day called out, “This is Leona. The Slow Loris”. I was like, “Huh, I guess I must be late!” However, she was actually introducing this very cute animal, and not actually making fun of me. What a surprise, as I had never expected to meet another Leona, what more an animal called Leona. Needless to say, I was immediately drawn to her, and it didn’t hurt that she was absolutely cute and adorable. While waiting for the Animal Magnet, Casey Anderson, we get to hang out and take pics with the wild animals on stage. Penny Tan, Marketing Director of FOX International Channels came out and talked a little about Casey Anderson and introduced him to the audience. 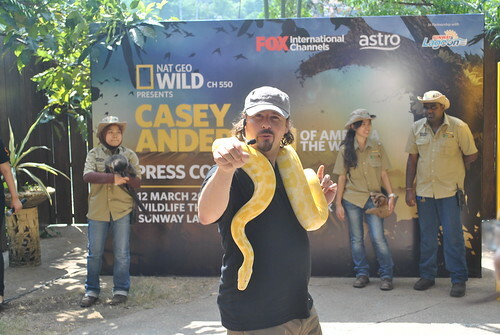 “It is truly an honour for us to be hosting Casey Anderson in Malaysia. His passion for wildlife is clearly known; he goes all out with guns blazing to see these creatures up close and personal. What may seem dangerous to us is just to him another day in the wild. That’s really amazing,” she said. Penny added that FOX International Channels is proud to host the premiere of America the Wild on National Geographic Wild as it is a show that seeks to educate viewers on the fact that all creatures have their unique roles and place in the ecology. Without much ado, Casey Anderson made a dramatic entrance with what looked like a yellow snake. Turns out, it was an Albino Burmese Python. Casey was very entertaining and from the way he talked to the animals, I could see he does not merely see them as animals only but as friends. For the normal human, we probably can’t tell what the animals are thinking or whether or not they have a personality, but Casey could tell what kind of personality they have, from the civet to King Kong the Blue & Gold Macaw. Well, since I have cats as pets, I do know a little of what he meant by that, since all my cats have different attitudes and personalities. Casey interacted with the animals and also let the audience touch them. It must be the first time I’d touched a snake, they felt leathery and rubbery. Pretty cool experience. I learned something pretty interesting about the civet. Casey says that some perfume uses civet pee as one of their ingredients. He also uses perfume near his camera equipment to attract other wild animals so that he could get a good film. Although I’m not a perfume user, I’d definitely never consider using them ever in the future, especially not when near wild animals. So be warned, keep your perfume at bay when visiting jungles or even the zoo. By the way, did you know the civet lives like just in our own backyard? John has seen them before while cycling. Unfortunately, due to massive development, these awesome creatures are slowly losing their habitat and thus, less and less of them exists. Casey definitely lived up to his childhood nickname of Animal Magnet when Leona the Slow Loris held him tightly and wouldn’t let go. Did I mention that she is so adorable? The Slow Loris are very dependable on trees, that’s why Leona loves to hug, as she wants to hug trees. 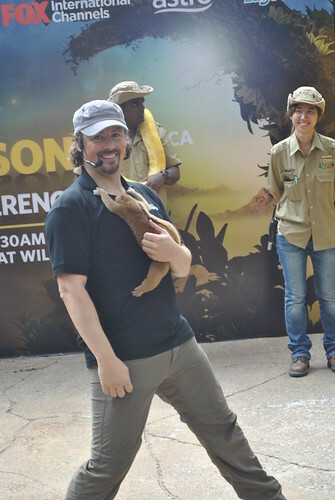 “Malaysia is so blessed to be home to a variety of animals and it’s such an amazing experience for me to interact with them,” said Casey. In expressing his excitement, Casey was quick to highlight that wild animals should be treated with caution. “It’s advisable for one to be safe around them. They are wild!” he said with a smile. Two lucky winners Low Peng Hoong & Mahes Arvin A/L Prmananth also won a once in lifetime opportunity to explore the lush green forests of Borneo (my homeland!) with Casey himself. The contest was a joint collaboration between Astro Circle and Nat Geo Wild to reward their loyal customers. After the press conference, we were divided into two groups for a treat to tour the Sunway Lagoon Wildlife Park. More about that in another post! It was definitely eye opening and very educational. This season on America the Wild, viewers will be enthralled by the many adventures of Casey as he plays it out amongst the of ‘Tofino Wolves’, ‘Vampire Bats’, ‘The Super Moose’ and many other species waiting to be discovered. America the Wild IV- Monster Wolf: The season premiere will unveil the mystique surrounding the ‘Tofino Wolve’, where Casey’s journey begins in the picturesque coastal hamlet of Tofino Canada. Rumour has it that these fearless creatures aren’t at all your typical wolves, and Casey delves deep to solve the mystery of these so called “Monster Wolves’. Will Casey’s valiant efforts meet success? America the Wild IV- American Vampire In another gripping episode, Casey makes an attempt to get up close and personal with an unknown yet deadly species, the Vampire Bat. In 2011, the first death by vampire bat bite was documented in the United States, but it won’t be the last. Join Casey as he plunges deep through the frontlines of Texas and Mexico, to uncover why Vampire Bats are making a comeback. The question is should we be afraid? Casey goes undercover to explain the bizzare and unpredictable moose behaviour during the peak of the mating season- when moose leave behind their solitary day-to-day existence to gather spectacukar hormone-fuellled frenzy known as a ‘supergroup’. Truly, this season of America the Wild will have viewers on the edge of their seats as it ventures into the extreme depths of wildlife secrets. Don’t miss the opportunity to join Casey in his adventures for the season premier starting on the 16th of March, 8.40 p.m airing on Nat Geo Wild, (Astro Channel 550) brought to you exclusively by Fox International Channel. It’s showing this Sunday, and I’m definitely going to record it.